I’m hardly the first to say this, but the “point” of yoga is not to become super bendy, to put your feet behind your head, or to master a bunch of flashy poses and then post photos on social media. I also think it’s a bit presumptuous to posit a single purpose to yoga, as though there were some creed of yoga orthodoxy which must be accepted, but that’s another story. Why have a set plan for your yoga? It’s a journey-not-destination kind of art. I would say that one of the main purposes of yoga is to bring balance to the body, to help us soften where we are stiff, and to help us strengthen ourselves where we are weak. We might never snag a deal modeling high-end yoga couture, but hopefully we will become the best version of ourselves that we can be. There’s no cookie-cutter model for fitness and health, which will look different in every body. That being said, I have one caveat to the yoga-isn’t-about-flexibility line, because in some ways it is. Most people will experience some increase in flexibility from practicing yoga, probably not at contortionist levels, but noticeable nonetheless. Tight hamstrings and lower backs will open up, and people who haven’t been able to touch their toes since they were children will suddenly become reacquainted with them. This is not because yoga is just about stretching with no strength involved. Again, yoga is supposed to bring balance, so we aren’t trying to turn into bendy weaklings who can’t heft anything heavier than a soup can. In fact, as anyone who has taken an Ashtanga, Bikram, or vinyasa class knows, yoga can involve a great deal of muscular engagement, and even leave you feeling sore from all the chaturangas, planks, and chair poses. The reason most yoga practicioners experience an increase in flexibility over time is because most of us come to yoga, in the beginning, in a chronically tight condition. It’s not natural to not be able to touch your toes, or for your seated wide-legged forward fold to never get past an acute angle. We are not meant to be so tight and brittle that we throw out our backs from the simple act of bending forward to pick something up. Rather, many adults have built up this inflexibility through years of perverse dedication to being as immobile as possible. Once we realize that we’re leading sedentary, unhealthy lives, many of us go the opposite direction and overcompensate by exercising as aggressively as possible. Never mind all those hours at the desk, we think, I’ll just cancel them out with a few zealous workout sessions a week! At this point, maybe we lose weight, but our bodies become increasingly bound up by patterns of muscular tension. I’ve seen many students like this in yoga. Even a fairly routine pose like downward dog becomes impossible for them to hold for more than a few breaths. Their tight shoulder and back muscles make it difficult for them to lengthen into the inverted “v” of the pose, and instead they get stuck somewhere in between downward dog and plank, a much more burdensome shape to hold. If you have a sedentary occupation and want to counteract its bad effects on your health, then by all means run, lift weights, box, grapple, or pursue any other athletic activity that strikes your fancy, but don’t neglect your yoga and stretching in between your other activities, either. Inflexibility isn’t a sign that you’re too tough and badass to do yoga- it’s just inflexibility. On that note, Royler Gracie, one of the most accomplished jiu jitsu fighters in the history of the sport, is more flexible that I am, although he’s also nearly twenty years older than I am. Flexibility often gets a bad rap, even among yogis and yoga teachers, when in fact you can be both flexible and strong (within reason). Another prevalent theme in recent yoga writing is the proliferation of injuries from yoga, which is correctly attributed to people pushing themselves too far, too fast. It takes time for tight muscles to open up, and you can’t just grit your way to faster results. Some yoga teachers have become so traumatized by this that they hesitate to challenge students at all, or counsel them to back off at the slightest sensation of stretching. Just because it’s possible to injure yourself from overstretching in yoga, doesn’t mean that we should remove all emphasis from flexibility and stretching in a fitness regimen. In the time I’ve practiced yoga, I’ve gone from a stiff long-distance runner, with a recurring knot in my back from carrying books during grad school, to someone who’s frequently described as being “bendy,” or “like a rubber band.” I’m not naturally flexible, I’ve just been persistent in my practice. I’ve also been mostly injury-free during my time doing yoga. The only time I’ve hurt myself,I was attempting to do the splits while I was angry from a conversation I had just had- obviously not the most advisable time to be pushing my limits. For the most part, I’ve practiced three or four times a week, gone to the point of sensation but never pain in my stretching, and avoided stressing out when I didn’t have a certain pose. Some people, seeing that I’m bendy, have even wondered if I have joint hypermobility syndrome, which I don’t. I meet almost none of the criteria, which are listed above. In addition, hypermobile people tend towards frequent injury and take a long time to heal, whereas I’ve always healed almost freakishly quickly, as my doctor told me after I had knee surgery (after my one major injury from jiu jitsu). Many people mix up the terms “hypermobility” and “flexibility,” which are completely different conditions. 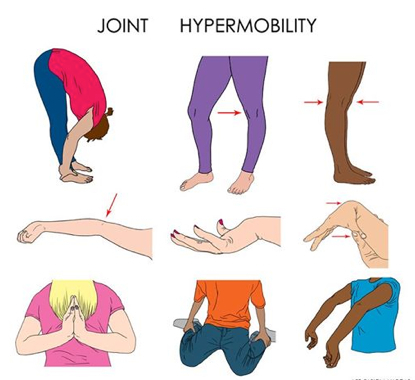 Some even speak of yoga as though you could “catch” hypermobility from doing it, when in fact hypermobility is frequently genetic, or linked to serious, but uncommon, connective tissue disorders. It is possible to develop flexibility in muscles surrounding a joint to the point that the joint becomes unstable and weak, but doing so takes years of unhealthily obsessive yoga practice. Most of us will never get remotely near that point. Once we have optimal flexibility throughout the body, and have undone the effects of all that sitting and rigorous exercise, then we can worry about becoming too flexible. You can, undoubtedly, injure yourself doing yoga, but you can also injure yourself while running, lifting, doing martial arts, dancing, or even by taking a misstep when you get up from the sofa to get yourself another bag of cheetos. I still think yoga is safer than many other forms of exercise, although I may be biased since my main form of exercise is martial arts. You know what’s riskier than stretching, though? Not stretching.